DLA Playground, written in Processing, is an applet, where user can plant seeds and create sources to grow the seeds. The sources create and distribute particles which can aggregate on seeds . 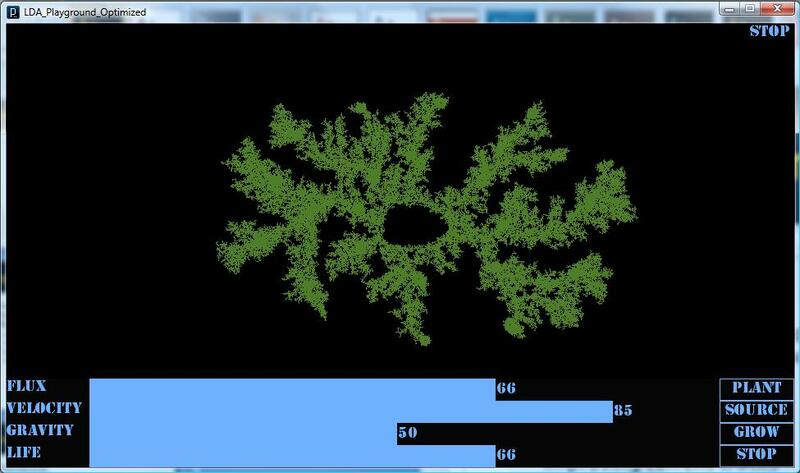 The software simulate growth of seeds using Diffusion Limited Aggregation. You can find the applet here. DLA Playground UI is consist of three parts, buttons, scrolls, and sketchpad. There are 4 buttons which one can use in order to switch between 4 different modes of applet, Plant, Source, Grow, and Stop. In each mode the sketchpad usage is different. In Plant mode, user can plant seeds by dragging mouse on sketchpad. In Source mode, user can create radial source by clicking on sketchpad, or create linear source by dragging mouse on it. Before creating a source user can define the behavior of source based on source flux of particles, particles velocity, gravity, and life, using scroll-bars. By pressing Grow button, applet start simulating growth of seeds based on seeds plantation and sources distribution. There are, also, another version of the applet here, that simulates how sources distribute particles on sketchpad. 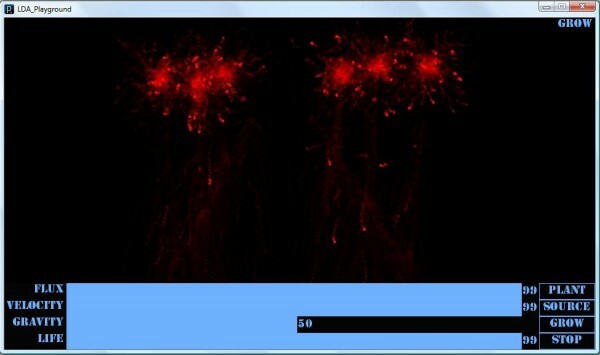 One can create firework images using this applet.